Jinjiang Inn Xi'an Zhonglou Luomashi is located at No. 26, Luomashi Pedestrian Street, Dongda Street. 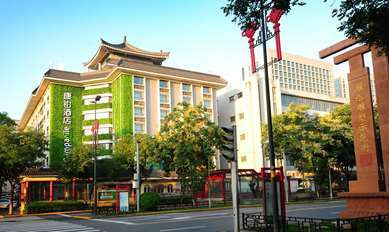 The Hotel is at the entrance of Bell Tower Metro Station, and surrounded by hub stops of many bus lines as well as tourist attractions. It has Xinglianxin Cafe, providing you richly nutritious, delicious and fast three meals. It has no-smoking floors and a small meeting room accommodating 15 persons or so. It can receive foreign guests, and provides broadband access (bring your own computer), full WIFI coverage, and one-day long-distance call at cost of RMB 3, so that you can communicate with relatives and friends freely. The N-1 reasons to choose Jinjiang Inn Xi'an Zhonglou Luomashi: I. Convenient surrounding transportation: 1. From Airport Shuttle Bus to the Hotel: take Bus Line 611/300/K630, etc. from Xishaomen and get off at Bell Tower Stop, and then enter the Luomashi Commercial Street. From the Hotel to Airport Shuttle Bus: pass Luomashi Underground Passage to Anban Street Exit, take Bus Line 611/300/K630, etc. and get off at Bell Tower Stop, and then you can take the Airport Shuttle Bus. 2. From Railway Station to the Hotel: take Bus Line 611 and get off at Bell Tower Stop, pass the underground passage of Bell Tower and walk from East Avenue South Exit (Kaiyuan Shopping Mall/Luomashi) to Luomashi Pedestrian Street, and then you can reach there. From the Hotel to the railway station: pass the underground passage of Bell Tower and walk from East Avenue North Exit, take Bus Line 611 at the bus stop and get off at Railway Station. 3. Xi'an North Bus Station: take Metro Line 2 to directly reach the North Bus Station. 4. There are many bus lines leading to Chengdong Passenger Station (Bus Line 43), Chengnan Passenger Station (Bus Line K203), Chengxi Passenger Station (Bus Line 222), and Chengbei Passenger Station (Bus Line 37), etc. II. Surrounded by tourist attractions: 1. Bell Tower and Drum Tower can be reached by walking for 5 minutes. 2. Ming Dynasty City Wall and Stone Tablets Museum can be reached by walking for 8 minutes. 3. Take Bus Line 609 or 606, etc., you can reach Greater Wild Goose Pagoda, Tang Paradise, Qujiang Relics Park and other famous tourist attractions. 4. Take Bus Line 306 (i.e. Tourist Line 5) at east square of Railway Station to the eighth wonder of the world Buried Sculpture Legion, Huaqing Hot Spring and Qin Imperator Mausoleum. III. Strong commercial shopping atmosphere: 1. Large shopping center - Kaiyuan Shopping Mall, Kaiyuan Shopping Mall, Minsheng Department Store, Xingzhengyuan Shopping Street, Century Ginwa Shopping Mall, Zhongda International and Wanda Plaza, etc. II. Special delicacies: Muslim Snack Street, Qinyu Chinese Sandwich, Weijia Cold Noodles, Laosunjia Pita Bread Soaked in Lamb Soup, Haidilao Hot Pot, Starbucks, Burger King, DQ, Haagen-Dazs and Xingji Desserts, etc. 3. Recreation and leisure ---Rolling Stones Xintiandi KTV, Xinshengdai KTV, Oscar International Cinema, Fantasy and Defuxiang Bar Street, etc. 4. Banks --- Bank of China, Industrial and Commercial Bank of China, Agricultural Bank of China, China Construction Bank and China Merchants Bank, etc. 5. Hospitals --- Xi'an No. 1 Hospital, Xi'an Central Hospital, Xi'an Hospital of Traditional Chinese Medicine, The Second Affiliated Hospital of Xi'an Jiaotong University and Xi'an No. 4 Hospital, etc. 6. Supermarkets---Wal-Mart, China Resources Vanguard and various 24-hour convenience stores, etc. Welcome to Jinjiang Inn Xi'an Zhonglou Luomashi.